Veteran forward Quinten Lynch has called it a day after 227 senior games for Collingwood and West Coast. Hear from the retiree as he and his family take centre stage on The Club (Season Two, Episode 24). Veteran forward Quinten Lynch has called it a day after 227 senior games for Collingwood and West Coast. Hear from the retiree as he and his family take centre stage on The Club (Season Two, Episode 24). 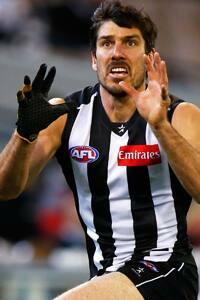 Quinten Lynch has announced his retirement from the AFL after playing 227 senior games, 18 of which were for Collingwood. Quinten Lynch has called time on his distinguished AFL career, a 13 year journey which began in the west, finished in the east, opened in the livery of an Eagle and closed in the colours of a Magpie. One of the most successful rookie selections of all time, the 31 year old informed team-mates of his decision this afternoon. Lynch will leave the game once Collingwood’s AFL and VFL campaigns are over with a reputation as a long kicking, powerfully built centre half-forward who could score from range and, despite his relative lack of centimetres, make a physical contest of regular stints in the ruck. He brought these qualities to his first season in Black and White, 2013, but a leg broken in an early season VFL match has seen him miss much of 2014 and only recently return to playing. An extremely popular member of the change room at the Westpac Centre, where his experience, dedication and encouragement has been of enormous benefit to the squad, Lynch will retire having played 18 matches for Collingwood. In all, he has played 227 matches, kicked 290 goals, twice won West Coast’s goal kicking award and shared in the Eagles’ 2006 premiership. “I have enjoyed a wonderful ride,” Lynch said. “The frustrations of this year have only been a small part of a long career I never thought I would have. It was fantastic to enjoy success with the Eagles and to finish my career in Melbourne with the experience of playing on the MCG in front of big crowds for a wonderful club. Lynch’s rookie-made-good story – he was selected by the Eagles with pick 19 in the 2002 rookie draft – has been bettered by few and, at West Coast, overshadowed only by the feats of the great Dean Cox who was rookied two years earlier. After 11 years of fine service as an Eagle, Lynch arrived at the Westpac Centre as one of the game’s first free agents. Free agency came into effect at the end of the 2012 season. “‘Q’ set a wonderful example, particularly for our younger players,” Collingwood Director of Football, Rodney Eade, said. “He was a fantastic person to have around the club. His attitude, his training standards, his investment in the team and his team-mates was always outstanding. Lynch, his wife Daneka and children Addison and Louis are planning to return to Perth in October. Recruited: Pick 19 in the 2002 Rookie Draft (Lynch crossed to Collingwood as an unrestricted free agent at the end of the 2012 season).